Within Europe we are limited to a video transmitter output power of 25 mW EIRP. 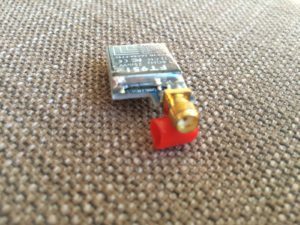 This means that to stay legal you have to slow yourself down when it comes to buying the right video transmitter (VTX) for your FPV setup. 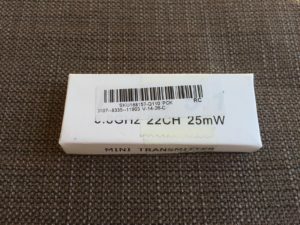 Even if there are a lot of 200 and 500 mW VTXs available, they are simply not legal to use. 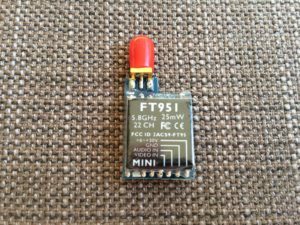 This review therefore looks at the FT951 Mini Transmitter, featuring 22 channels and a 25 mW transmitter module. 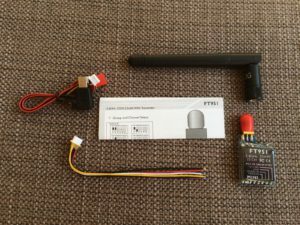 Getting ready for your first FPV flight is tough, even after this technology has been around for the last few years, variety of different and partly incompatible products is vast. This article is not going to be a how-to guide on getting into FPV, though. I rather will look at the FT951 transmitter* in more detail, assuming that you know, what all the FPV surrounding topics are about. That said, let’s begin. The market of FPV transmitters* in the 25 mW range is quiet broad. You can buy modules in many different physical sizes, which cover different bands and channels within those frequency bands. As I started out with FPV in 2013 there almost only have been eight channel VTX modules available (mostly BOSCAM A). Nowadays a modern module supports different bands and channels and thus gives you a whole lot more flexibility when setting up your equipment to go fly with your buddies. 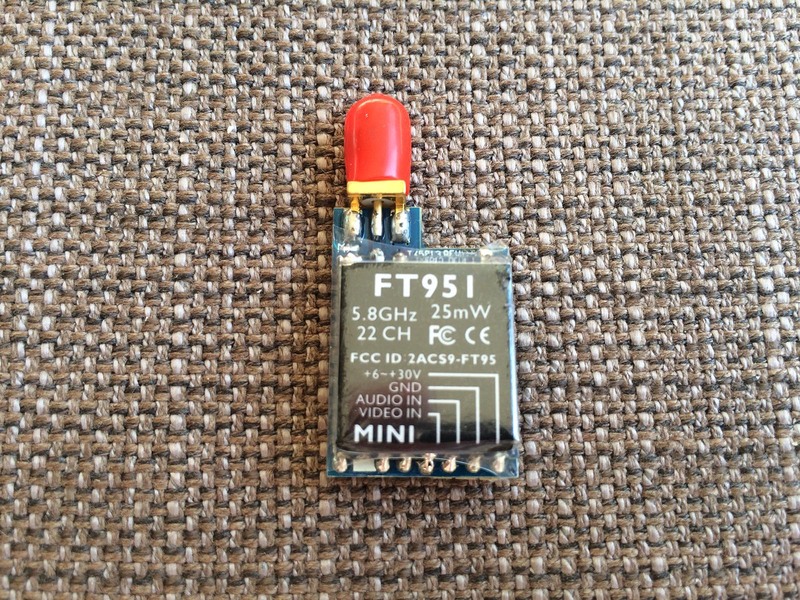 One of those VTX is the FT951 Mini Transmitter*, which usually can be bought from Hobbyking or directly from one of the big players in China (e.g. Banggood). The module seems pretty popular, because it simply has a very attractive price tag compared to other products. The following table shows the most common 25 mW transmitters to give you an overview. 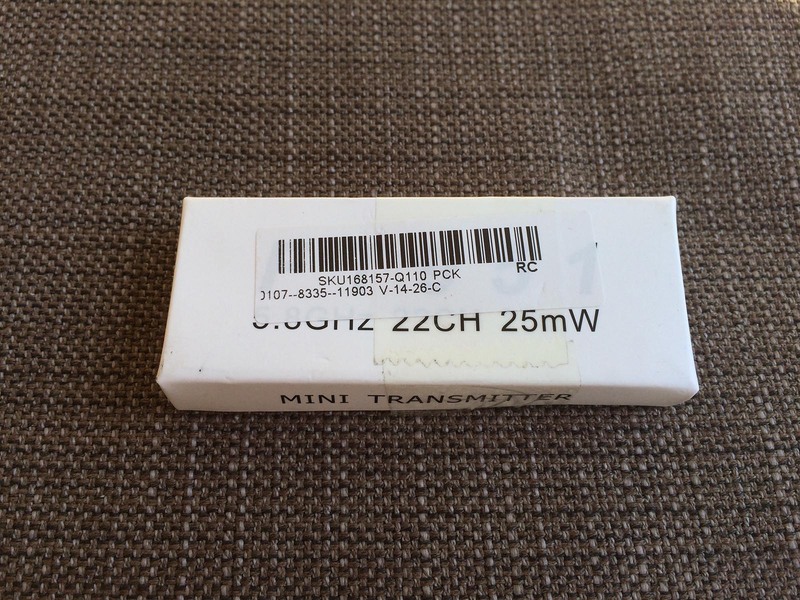 The transmitter comes in a tiny cardboard box with just a few words on the outside. It’s not branded by any manufacturer, I guess that’s why it is sold so cheap: Just straight from the factory, no big marketing budgets spend on this. 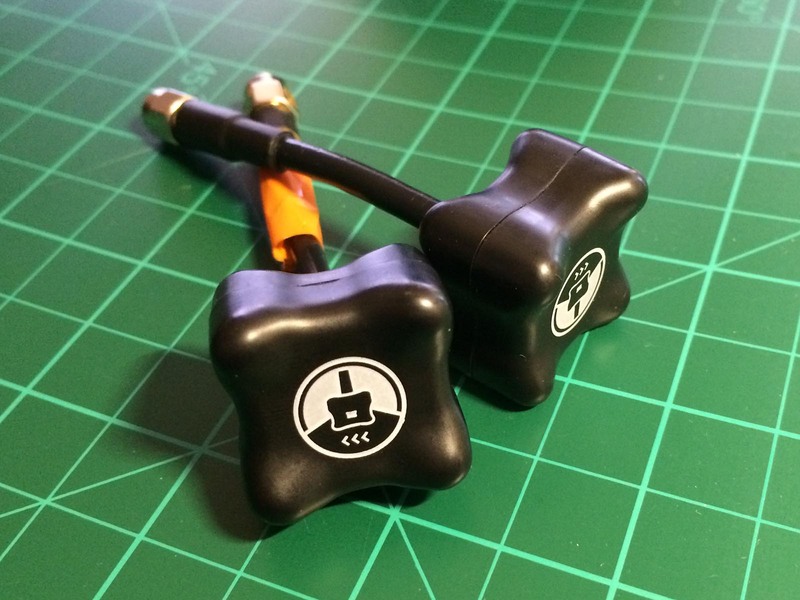 Inside you find the VTX*, a standard pole antenna, a USB-adapter to connect your HD-cam and a adapter cable with loose ends to solder onto whatever you like. On top you get a small sheet of paper which teaches you how to select channels and bands properly. The following table lists additional specs for the FT951 transmitter. First thing you will notice once everything is set up and you are ready to proceed with channel selection: The factory simply put shrink wrap over the dip switches. Just cut them free with a small knive. I had some of these VTXs* going trough my hands and all came like this. It simply is cheaper to make them this way – spares a whole step in production. Once you can access the dip switches you can set your channels using the two tables on the sheet that came with your transmitter. Important to know: The black box in the table shows the position of the switch! I spend some time figuring this out as my TBS* Greenhorn VTX is the exactly the other way around. Also never turn on the VTX without a load /antenna connected. I lost my antenna in flight and damaged my FT951 VTX* respectively. It’s not completely unusable or dead, but range is decreased to just a few meters. Performance is solid for the price your are paying. With some good antennas you will have no trouble flying around the park. Giving a precise distance is hard as the range depends strongly on the surroundings of your flying site. I would estimate that 500 meters at a decent height of around 60 meters are possible with circular polarized antennas. 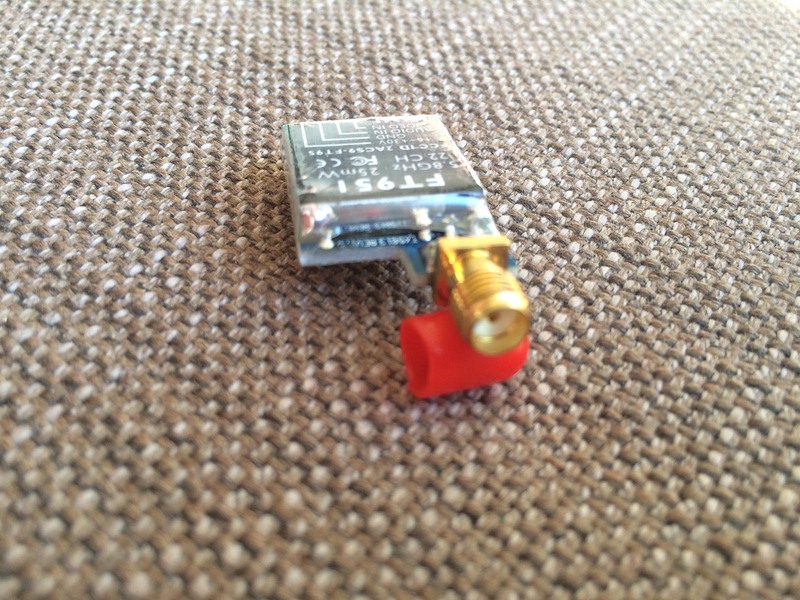 Using a patch antenna or even a tracked helix antenna on your receiver will increase your range by a lot more. For going around a track on a field with no / not a lot trees in between you and your quad this 25 mW VTX performs well. Choosing the right VTX* is not always easy, as the table above shows. And even here you find some transmitters that potentially support bands / frequencies that are not permitted for use in the European Union. So be that kind and double check with your local authorities before powering on and interfere other applications using the same band or frequency. The FT951* itself is well made and apart of the dip switches story, easy to configure and use. I really like the compact size and the weight of only 7 grams. For a price tag of around 20 € you can’t go wrong with the FT951 in my opinion. One downside that shouldn’t be unmentioned: The FT951 does not support Race Band. That’s at least a downside if you are regularly participating in racing events as the frequency spread of Race Band is optimized for heaving up to eight pilots in the air simultaneously. In Germany you only are allowed to use four of these channels anyway, which makes usage kind of obsolete, as you can realize four pilots on any of the other fully legal bands as well.